I found this little gem while looking through the recommended games for Wayward Souls. Devious Dungeon is a super simplistic rogue-like, or at least a rogue-lite because you don't really lose built up stats or stuff. But that isn't always a bad thing. Here you are a hero charged with going into the kingdom's catacombs to rid the place of these monstrous usurpers. 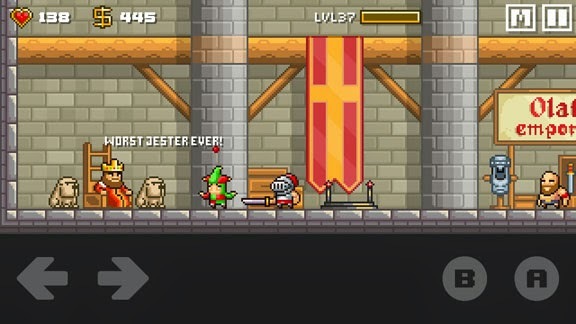 There's the scarcest form of an RPG type leveling system for your character, as well as purchasable (either through IAPS or collecting coins in game) armor, weapons, potions, and jewelry to further enhance your efficacy in monster slaying. The randomly generated levels through five worlds get to be very familiar and finding any of the "secret areas" is almost a joke because by the end of the game you can usually guess the map because they aren't too large, and are all too familiar after playing them a few hundred times to earn coins. To break up the typical rogue-like structure, there are checkpoints every three levels that makes it much more tolerable of the high number of deaths you'll suffer (even touching an enemy causes damage). All your purchased upgrades and equipment follow you as well. This makes it a smoother play for some. Somehow, it isn't nearly as bad as it sounds. Ravenous Games has made something extremely enjoyable for small bits of time. You can load and play through a level in just a minute or two, and it avoids any chance at boredom by just being short and good. The controls are superb on the touchscreen, making the platforming action go over easy. There is just enough variety to keep players coming back for a little more entertainment. Every level comes down to finding the key, then the door to the exit, and slaying everything in your way to looting coins and destroying bosses. It would've been nice to be able to choose other characters or classes, but as it is, the game is great because of its simplicity. 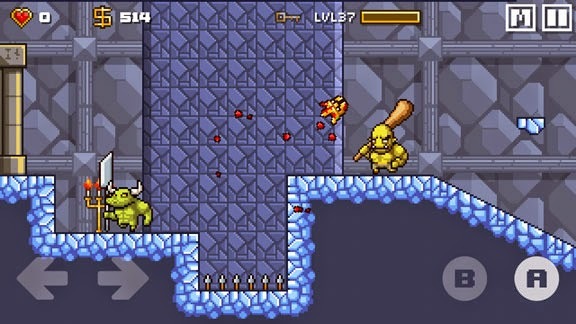 Devious Dungeon is the simplest platforming action RPG rogue-like possible, but it packs a tremendous replay value for its $1.99 Google Play price.